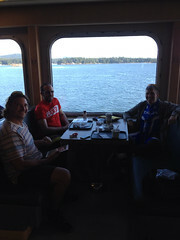 Day 6 | Coquitlam to Anacortes | captain-nicholls | Le Tour de U.S.
We left Jim's around 9 AM and took the most confusing route imaginable to get to the ferry terminal. I'm glad Jim was leading as I had no idea where he was leading us. We took a break on the Alex Fraser Bridge and took a couple of pictures before heading onto the ferry. We arrived there around 12:30 and we were on the 1:00 sailing. We met a guy named Tom who was going over and had a short chat with him. Arriving at Schwartz Bay we rode onto Sydney to catch the ferry to Anacortes. Our ferry was scheduled to leave Sydney at 5:55 and we arrived around 5:00. We met a couple people that were boarding with bikes as well. One girl from Ontario who is riding the San Juan Islands and another guy named Marco Dos Santos who is riding to Mexico from Vancouver. He was on his way to Anacortes as well but he is camping so we parted ways at the ferry terminal USA. 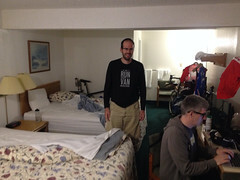 Francois, Jim, and I rode into town and found a fleabag hotel priced $105.00 for two rooms so we checked across the road and got one room with a cot for $105 and it is a nice room. We drew digital straws, which in this case means, we guessed a number between 1-100 and the one farthest from the number drawn got the cot. 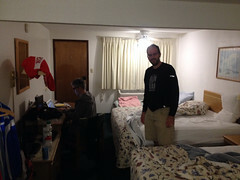 Francois found a random number generator online AND he got the cot. We were a bit hungry so we went to Jack in the Box as it was the only thing in eye sight. Jim ordered something with turkey and he was told that "the turkey has been recalled". We ordered chicken. Francois getting some quality sleep on the ferry. 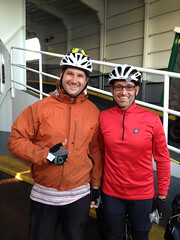 Met Marco Dos Santos on the ferry to Anacortes. He's riding to Mexico from Vancouver.